"The time has come at last. The darkness will awaken. New fears will be born. Nothing can stop it now." Nina: We're getting really good at stealing ships aren't we?Millie: We're the best in the universe!The final five episodes of Lost Universe continue to build on the storyline that kicked into gear on disc four. It maintains the darker, serious tone, with only occasional comedic interjections. The plot is becoming more complex, the backgrounds of each party are laid open, and the stage is set for the final showdown.Kain continues to take a beating at the hands of Nightmare, having to go into hiding to exact repairs on Swordbreaker. Rail is having problems of his own, when his newly acquired Lost Ship decides it doesn't want him as captain. After being dumped by Kain, Millie winds up teaming up with Nina, who still can't understand why Rail betrayed the Universal Guardians. He gets a chance to explain a few things when they recover him from deep space, but we never really know what motivated him to do it. As Nightmare continues to gather strength, Kali finds herself put in charge of dispatching Kain for good, but with his ship running silent, she prepares to bait him out of hiding by blowing a few planets back to their dusty origins. Dark Seeder's plans are coming to fruition, as he awaits the inevitable showdown with Kain. Canal finally reveals the truth about Kain's past, allowing him to unlock more of the secrets of the Lost Ship, but he also realizes its true destructive potential. Before the series is over, the roots of darkness will be seeded in the galaxy, with only Kain and his crew to defend it, as the battle of good and evil comes to a head.Looking back on the series, I have to admit that I much preferred the opening half, where episodic tomfoolery and the interpersonal shenanigans kept the atmosphere off balance and light. The second half's shift into a serious plot did give the show some meat, but at the same time the character that had hooked me was set aside. The Japanese voice acting was excellent, and really embodied the roles. The dub, on the other hand, left me flat, primarily due to the rescripting, which killed the best comedic portions. I did enjoy the experience in the end, but feel this could really have been two series, or could have tried to maintain a higher degree of levity towards the end. It is certainly worth watching despite some misgivings, and the disc count helps balance out any shortcomings from an investment standpoint. Image Transfer Review: Image quality remains consistent with the rest of the series, pretty good overall, with some minor issues. There is a fair amount of grain, most noticeable in darker areas, and some scenes are a little less focused than others. Colors are good, and black levels are generally solid. Normal amounts of aliasing and interlacing are also present. Audio Transfer Review: Stereo audio is quite good, though there is some edginess in places. The soundstage is utilized appropriately, with dialogue fairly anchored to center, and the extremes used for the score and sound effects. Frequency coverage is consistent with previous volumes, the low end a bit understated, but without feeling too top heavy. Extras Review: Extras consist only of more front loaded, but skippable trailers for Nadia of Blue Water, Monster Rancher, AD Police, Bubblegum Crisis: Tokyo 2040, Martian Successor Nadesico and the ADV mix trailer. Like the previous discs, the main menu also allows access to the trailer reel, though you'll need to chapter skip to the individual titles. Boom! Dinner's ready! 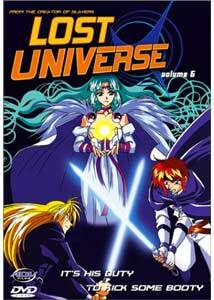 Lost Universe was a fun and adventurous series, with plenty of action, good characters, and a decent story. The blend of CG and traditional animation took a bit of getting used to, and while the transition from an episodic comedy to a more somber dramatic show wasn't what I had hoped for, there was still enough to hold my interest until the end. The series is worth the investment for the kitchen comedy alone.